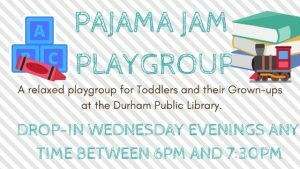 A relaxed playgroup for Toddlers and their Grown-ups at the Durham Public Library. Siblings welcome! Come play in the Children’s Department and make a family craft on Wednesday evenings.